I don`t know about you, but I cannot wait for the Showdown over the City. If you don`t know, the Showdown will be taking place this Friday and Saturday at Grouse. The course is pretty gnarly this year with some big features. I thought I would snap some shots of the course exclusively for you, our Grouse Park viewers. Here it is from top to bottom. For more info check out the official Showdown over the City website here. 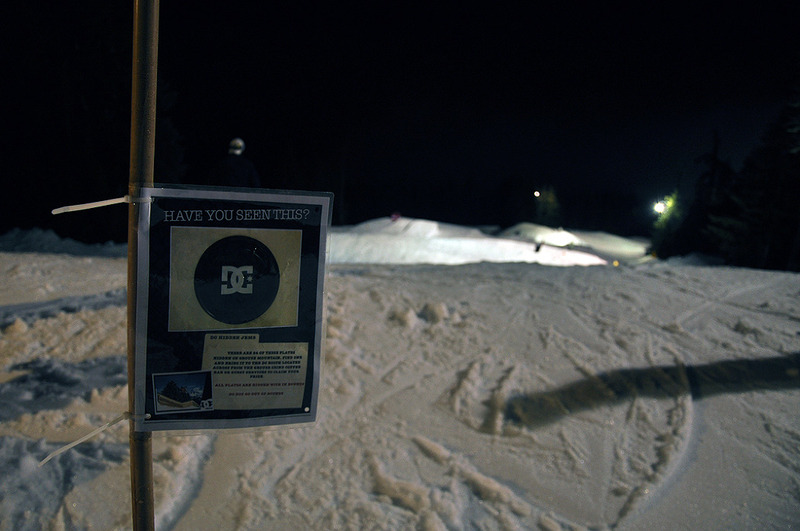 We went up to Grouse for the 24 Hours of Winter to try our luck on the DC Scavenger Hunt. We searched around the whole mountain but our eyes were not peeled enough to find one. The hidden frisbees, if found, were redeemable for prizes in the lodge! Lots of people were on the lookout and the frisbees were being tracked down left and right. 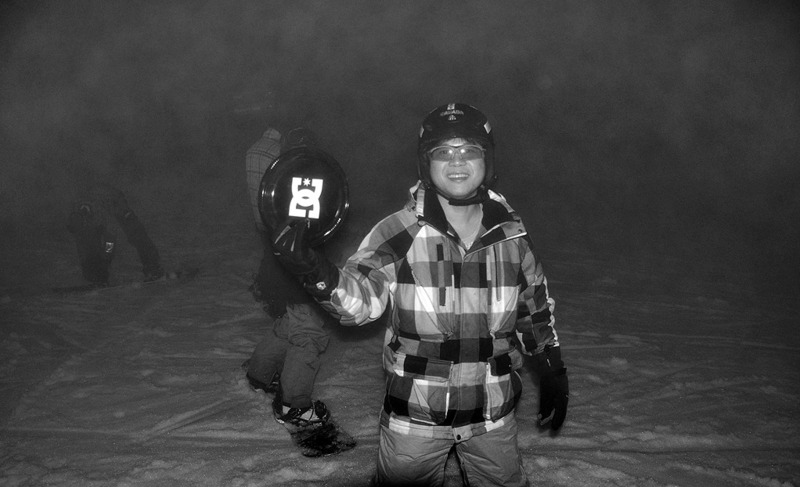 Unfortunately I guess I don't have the right skills for this game, but many were very successful on the foggy night! 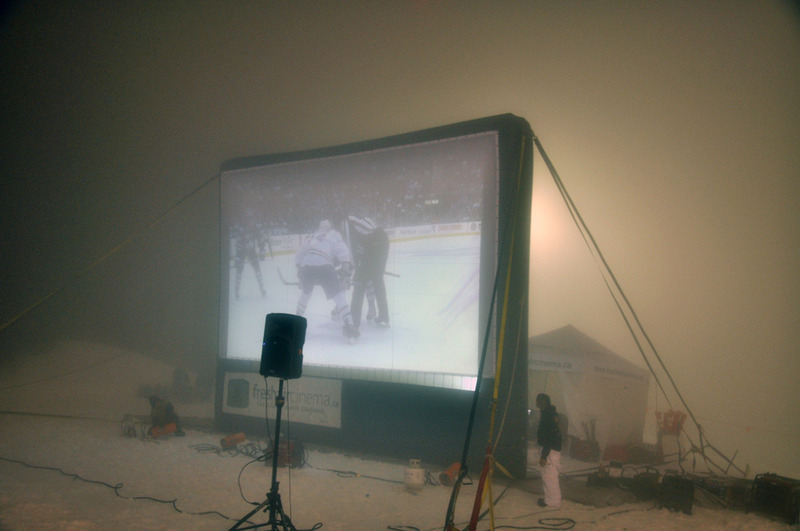 The Canucks game had begun in the mist with snow-made stands. Runs were fun to rip around, the snow was soft and the bumps were prime! Shreddable all night. This dude was hyped on his find!! 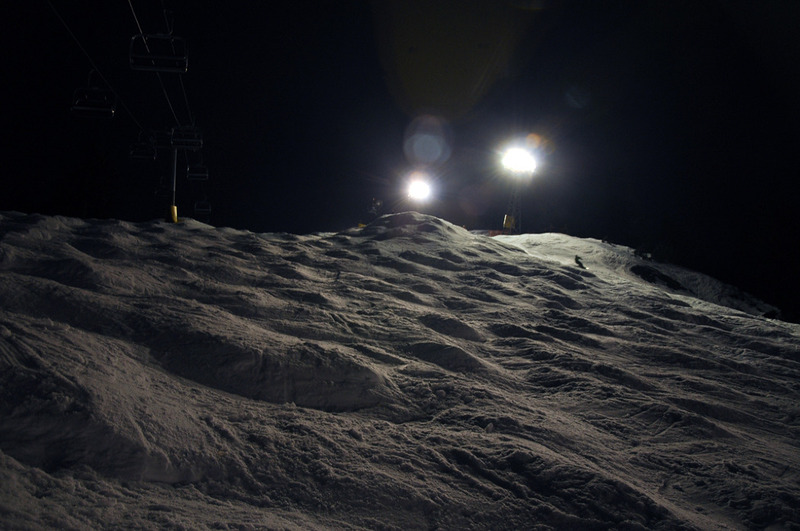 Terrain Parks: Non-stop Sat-Sun Park Jam 11pm – 1am Park Jam will be open to all amateurs skiers and snowboarders from 11pm to 1am. DC Booth: DC Booth will be located in the North East area of the Canadiana Room! Come and grab some cash in the Money Booth and redeem your earnings for prizing! DC Scavenger Hunt: Find the DC frisbees hidden all around the mountain and redeem them for a prize at their booth! Check Twitter and Facebook for clues! Altitudes After Dark Deck Party: We are tenting the Altitudes deck to create the perfect spot to party all night! With a beautiful view of the city, the Altitudes deck party will play host to DJ Hebejebe until 4am, and there will be prizes to be won. Take a break from the hills, listen to some music and get ready to hit the slopes again at sunrise! I'll be up tonight riding the park and rocking my new playlist. Have a good 24 Hours of Shred! I have to say that both the Cut Line and Quikpark are prime right now. Did a couple laps yesterday and I was having way too much fun. I brought out the camera for the last run. Here are the results. These are only three of the many features that are up right now. Come up and check it out! Photo creds to Kaz Yamamura and a big shout out to the Park Crew. Roxy Ride Days: Coming to Grouse Mountain! ROXY RIDE DAYS COMING TO GROUSE MOUNTAIN! Come on out and have some fun with Roxy Ride Days Canadian Tour at Grouse Mountain! Learn new tricks, meet new friends and have a blast spending the day snowboarding with the WSF Roxy coaching team. Join in on a fun progressive day on the hill filled with park coaching sessions, mini jam comps and prize giveaways! Open to all ages & abilities! Includes Lunch & Roxy Gift Bag! Keep updated with us on the Grouse Park blog for these features, videos, regular posts from the contributors and more. With the city in view, the Quiksilver Showdown ran full-blast last Sunday. All riders were throwing down and out of the many competitors, the results came down to Zach Stone landing the Best trick, Bobby Balharry placing third, Jeremy Cloutier placing 2nd and Eric Willet with the win. With my t2i in hand and riders throwing down, I was stoked to get to film these guys. Check out the edit! The Whistler boys were in town for a couple of days so I brought the 7D out to shoot some pictures with them up Grouse. The conditions weren't the best but they were all throwing down regardless, stomping some of the best tricks these Grousepark features have ever seen. Like I said, conditions were not ideal but I managed a couple of alright shots regardless. Here's yet another amazing edit brought to you by Joy Footage. Riders are Patrick Rychter, Sam Fedak, and Grousepark blogger Simon Stulberg. Also just a shout out to all you riders out there to get your Y2Play pass they are going quick, so click on that lovely Y2Play banner above to get more details. After you've done that don't forget to head up to Grouse for this weekend's Roxy Chickadee Jam, which also includes a Mascot rail jam! For now just sit back, relax, and enjoy this killer edit! Please be advised that the Quiksilver Terrain Park will be on standby for the majority of the day due to a rebuild on March 08, 2011. Also The Cut Jump Line will be on standby due to a rebuild for the Roxy Chickadee Jam.. Those dates are March 9th-10th, 2011. If you haven't already heard the Roxy Chickadee Jam is this weekend March 12th & 13th come out and enjoy the show.